Dubai, UAE, October 09, 2018: In the Audi Dubai Showroom, home of Al Nabooda Automobiles, the Supreme Organising Committee of the UAE Tour have unveiled the event's new logo and the new winner's trophy. Both heptagonal – seven sided – shapes to reference the seven United Arab Emirates involved: Abu Dhabi, Dubai, Sharjah, Ajman, Fujairah, Ras al-Khaimah, and Umm al-Quwain. 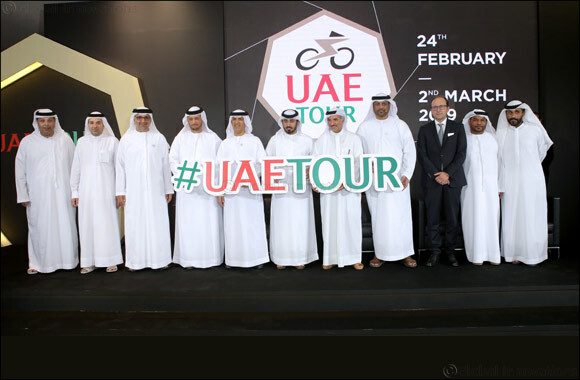 The merger between the Dubai Tour and Abu Dhabi Tour created a new seven-stage race that, in 2019, will start from Abu Dhabi and end in Dubai, while the 2020 race will reverse the route. The race, organised by the Abu Dhabi Sports Council (ADSC) and the Dubai Sports Council (DSC) in collaboration with RCS Sport, is slated for February 24 to March 2 and covers all seven Emirates. The logo consists of the ‘UAE Tour' name written in red and green, surmounted by a partially-black stylised bike at the top of the heptagon to reference the UAE flag. The edge of the heptagonal logo, together with a stylised bike details, is in beige, a classic color ever-present in the event's design identity. After the unveiling of the logo and trophy, the Supreme Organising Committee has also revealed some details about the UAE Tour's connected activities, such as the UAE Tour Challenge, formerly known as Abu Dhabi Challenge, and the successful Educational project. “Sharing the know-how, the resources and the effort with the other Emirates is very important to build up the race and to have new targets. We always talk about discovering the territory with the riders but it's just part of the big picture, that include activities such as the Educational program or the Challenge, which are now available to more even students and fans. This is the way: to increase the audience whether locally or internationally,” said H.E. Saeed Hareb, Dubai Sports Council Secretary General. “Every edition of the Dubai Tour involved our territory but this is the first time we've worked together for the same purpose. Being here today to represent Sharjah is a big honor and I'm sure we're working in the right way to assure a big future to the UAE Tour and the sport of cycling in general,” said H.E. Eisa Hilal Al Hezami, Sharjah Sports Council General Secretary.